The religious monuments still surviving on the island stand as irrefutable witnesses to the intense religious activity of Crete's inhabitants from antiquity to recent times. Standing at the crossroads of major religious currents, Crete served as a site for the peaceful coexistence of different creeds, but often became a battleground between their adherents. 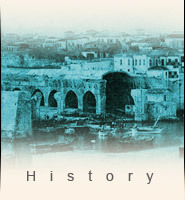 Over the course of time, the city of Heraklion was a typical example of such coexistence even until recently, Muslim minarets stood side by side with Orthodox Christian bell towers and the Jewish synagogue.